A Chinese teenager has died days after he was sent to an internet addiction treatment centre, reigniting criticism of these controversial institutions. The 18-year-old had allegedly sustained multiple injuries, and the centre’s director and staff members have been held by police, according to reports. The incident took place earlier this month in eastern Anhui province. China has seen a proliferation in so-called “boot camps” aimed at treating internet and gaming addictions. Some are known for their military-style discipline and have been criticised for overly harsh practices. In the latest incident in Anhui, the teenager’s mother, surnamed Liu, said her son had developed a serious internet addiction which she and her husband were unable to help. The parents then decided to send their son to a centre in Fuyang city which touted to use a combination of “psychological counselling and physical training” to treat children for their internet addictions, reported the Anhui Shangbao newspaper. Ms Liu dropped off her son on the night of 3 August. Two days later, the parents were informed that their son had been rushed to the hospital, where he later died. The exact cause of the teenager’s death is not known. But the parents said they were told by doctors who examined their son’s body that he had sustained more than 20 external injuries, as well as several internal injuries. They were allowed to see his body in the mortuary. “My son’s body was completely covered with scars, from top to toe… When I sent my son to the centre he was still fine, how could he have died within 48 hours?” Ms Liu was quoted as saying in Anhui Shangbao. State broadcaster CCTV said the centre’s director and four teaching staff have been held by police, and authorities have shut down the centre while investigations are ongoing. In the wake of the incident, many online and in newspaper editorials called for tighter regulation of addiction treatment centres – but also criticised the teenager’s parents. Addiction “boot camps” have grown in number across China in recent years. Some are run out of government hospitals while others are private centres or schools. They remain popular despite growing controversy over some centres’ practices, such as beating patients and electroshock therapy, and a string of shocking incidents. Last year, a teenager reportedly killed her mother for sending her to a centre where she was allegedly abused. Trent Bax of Ewha Womans University, who has researched Chinese internet addiction, says many centres use “emotive power advertising” which appeal to parents who want “a ‘quick fix’ solution to their child’s problems”. “The parents are also acting in response to a very real fear that the only child’s successful future may never be realised because they refuse to stop gaming and start studying,” he told the BBC. In some cases, says Prof Bax, parents may also hold the “‘traditional’ view of education that permits the use of violence to ‘straighten out’ a delinquent child”. 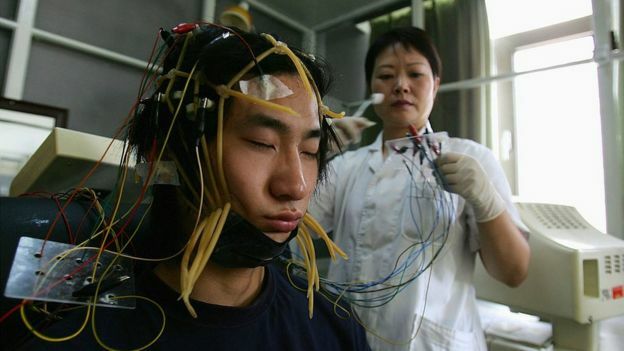 Chinese authorities have begun cracking down, and earlier this year drafted lawswhich, if passed, would explicitly prohibit abusive treatment of internet addicts such as electroshock therapy. Companies have also moved to limit minors’ excessive online gaming. Last month, internet giant Tencent began imposing restrictions on gaming hours for young users of one of its most popular games.